Stunning high-resolution display, incredible battery life, world's most advanced operating system, etc, iPhone iPad make them the first choice to view videos and movies. However, taking up a lot of space while storing a ton of videos, exercising in futility for you don’t know when you'll watch these videos you synchronized, and time consuming task in video conversion put you huff and puff. That’s why many video streaming apps like Air Video, Video Stream, etc pop up in the market, helping you stream videos to iPhone iPad. However, what about your DVD movies? Ever wondered to stream DVD movies to iPhone iPad for watching on the go without worrying about space limitations? Supposing you are travelling from France to Washington and want to watch DVD movies in your leisure time but rack your brain for dropping one of your DVDs to lessen your heavy package. What if you don’t want to waste all your iPhone iPad’s storage space on these DVD movies that you may not enjoy for a while? Eager to stream DVD collections to iPhone iPad for enjoying them wherever you are without space limitation? Don't be panic, software guru MacX DVD Ripper Pro can handle pretty much anything you can throw at it with aplomb. Working as a professional DVD ripping program and video streaming software, you can feel free to stream your DVD movies to iPhone XS/XS Max/XR/X/8/7/6S/ iPad (iPad Pro/Air 2/Mini 4 more ) on both Mac (macOS Mojave) and Windows (Windows 10) in one fell swoop. More notably, this DVD streaming software can also handle all protected DVDs written with various copy protection technologies like CSS encryption, Sony ARccoSS, Disney Copy Protection, etc, such that DVD to iPhone iPad streaming is no longer a hard nut. Genius! Below is the step-by-step guide on how to stream new DVD movies for watching on iPhone iPad on the move. Rip DVDs to MP4, AVI, MOV, Mac, more 36x faster. Free download this DVD ripper for iPhone iPad on Mac OS X (or get the Windows version as you need), hit "DVD Disc" button to import DVD movie you want to stream. Alternatively, you can import this disc by hitting "DVD Path". After finish loading the DVD, a small table pops up, as you want to stream DVD movies to iPhone iPad, so here you can hit "to iPhone Video" or "to iPad video" listed on Apple device from the drop-down list and then select the iOS device you want to view with. You can also stream the DVD movies to Apple TV if you choose output format as "Apple TV". Click the "RUN" button to start streaming your DVD movie to either iPhone or iPad. The whole dvd to iPhone iPad process is 36x faster with excellent quality reserved. Then you can stream the movies on DVDs to iPhone iPad with MacX MediaTrans to enjoy the device freely. 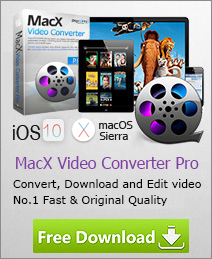 MacX DVD Ripper Pro boasts breakthrough new features like overhauled Mac-style interface, unique DVD backup function, optimized video editing function, better accessibility to latest DVD movies, etc, all making it stand out from other similar software, not to mention its DVD streaming ability for your iPhone iPad. Its built-in 283 output profiles enable you to rip and convert any DVD to iPad, iPhone, iPod, Samsung, HTC, AVI, FLV, MOV, etc. iPhone 6 is coming on the road! Wanna rip DVD to iPhone 6 for enjoying movies on the go? 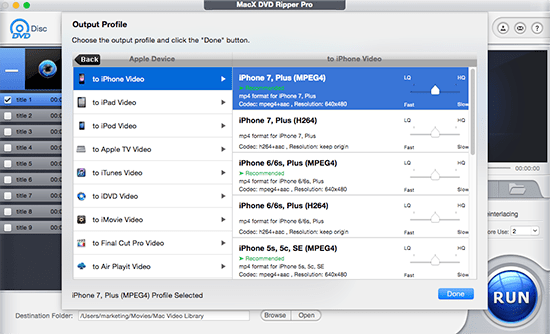 This article will show you how to rip and convert DVD to iPhone 6 without sacrificing any quality. How to transfer iPhone to Mac? This iPhone to Mac transfer is specially developed for Mac users to transfer iPhone/iPod/iPad to Mac computer. Wanna transfer DVD to iPhone for playback on your fashionable device? This tutorial will give you tips and tricks to rip and convert DVD to iPhone (iPhone XS/XS Max/XR included). Just a few clicks, you can finish transferring DVD to your iPhone for enjoying movies on the go. If you want to play DVD movies on Roku TV or Roku streaming players on HD TV, learn how to rip and stream DVD to Roku easily for free.